Today I’m answering a question from a mom, who was prompted to write after reading my SAT post. She wasn’t sure how to interpret the SAT scores nor how to find them at a couple of resources that I mentioned — the College Board and COLLEGEdata. I’m using Beloit College, my son’s school, to illustrate what you can find on the College Board. 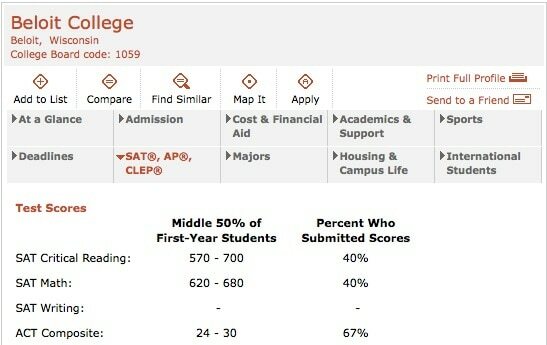 To locate the scores on the College Board, type in the name of any school in country in the search box on the home page and then click on the SAT, AP, CLEP link. It’s highlighted in red below. When you look at published ACT and SAT scores, they are commonly shown in a 50% range. That’s how they are presented in this screenshot of Beloit’s test scores. Among Beloit’s freshmen, 50% scored between 570 and 700 on the critical reading portion of the SAT. This means that 25% scored less than 570 on critical reading and 25% scored better than 700. The maximum score that you can achieve is 800 on each of the three SAT sections. Nationally, the average student scored a 497 on the critical reading section of the SAT. Sixty seven percent of Beloit freshmen took the ACT and you can see that 50% of the freshmen scored between 24 and 30. That means 25% of Beloit freshmen scored higher than 30 and another quarter scored lower than 24. The highest ACT score possible is 36. Nationally, the average ACT score is 21.1. Here’s where you can get a state-by-state breakdown of the average ACT scores for the class of 2011. To find the scores for any school on COLLEGEdata, click Search for Colleges link on the home page. This will lead you to the College Match page, where you can type in the name of a school. Then click on the school’s hyperlink and you will be led to a page that includes a variety of categories including Admission, Money Matters and Academics. You will find the test stats under the Admission category. 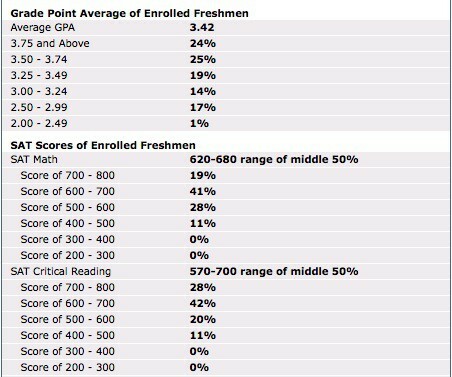 For students who have taken or plan to take the ACT and SAT, I’m sharing a table that compares the scores for the two tests. This chart compares the SAT’s critical reading (CR) and math (M) with the ACT composite score. 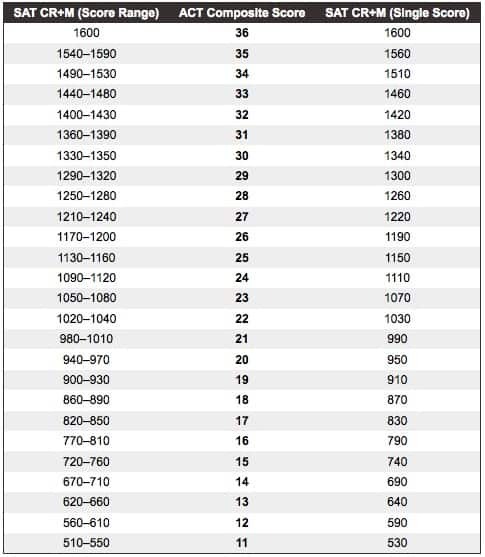 My son only took the SAT, but I wish I had known about this chart when my daughter was trying to decide whether to send her ACT or SAT scores. She sent both even though I later learned that her SAT scores were better. For those interested in reading some experts’ opinions about the necessity of the SAT, I’d urge you to head over to The New York Times today where there is a spirited debate about the controversial test. Here is the link: Why Does the SAT Endure? Should I Hide My Home Equity? Lynn, I have been reading your newsletters for the past 3 years. Luckily, a friend passed your link onto me when my oldest daughter was starting her college search. Your newsletter has been the most informative, relevant, useful, helpful tool in our college searches even now as our second daughter begins the application process. I feel as though I always get a good tip from each of your newsletters. I am paying it forward by passing your link onto other friends with children starting their college search. Thank you! Thank you for the further detail. The post is very useful. I am going to bookmark it. Thanks very much for this information, Lynn, especially the SAT / ACT comparison chart. Our son (HS senior) also took just the SAT, but I think I will encourage our daughter (now a sophomore) to take both and compare. Thanks! Jane and Kate – Glad you found the post helpful. And thanks for your comments. It’s always nice to hear from people who visit my blog. Please help me spread the word about my blog!